At least seven people have been killed in simultaneous attacks on government offices in Mexico's resort of Acapulco. In one attack, gunmen opened fire at a state attorney general's office, killing two policemen, a public prosecutor and a secretary. Elsewhere, two policemen and a secretary were killed when another group attacked a police station. The attacks come after President Felipe Calderon ordered thousands of troops to the city to tackle drug-related crime. The twin assaults, which occurred just before 1100 (1700 GMT), were carried out by groups of about eight heavily armed gunmen said to be wearing army-style khaki uniforms. At one of the offices a gunman asked those inside "Are you the only ones here? ", before the other men opened fire. Eyewitnesses say both attacks were filmed by the gangs. President Calderon has called an emergency meeting with his security cabinet to discuss the attacks in two neighbourhoods about 15km (nine miles) north of the tourist zone. 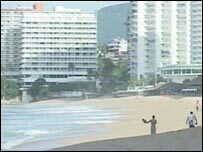 The BBC's Duncan Kennedy in Mexico says Acapulco, once a haven for film stars, has suffered a wave of attacks in the past year as rival drug cartels fight to control coastal smuggling routes. Last month the president sent almost 8,000 troops and federal police to the region to tackle the gangs. A further 16,000 have been sent to other lawless regions of the country. Tourists have not been immune from Acapulco's violence either. On Saturday two Canadian travellers suffered minor injuries after being grazed by bullets at one of the city's hotels. In January there were 190 gang-related deaths in Mexico - just a handful less than a year ago despite the government crackdown.